An estimate of the market value of the property. The sum of all the interest options in your policy, including interest. An amount of money invested plus the interest earned on that money. The amount of cash payable on a benefit. 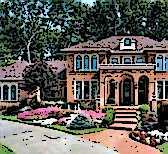 A written report by a qualified appraiser estimating the value of a property. The dollar value of an asset assigned by a public tax assessor for the purposes of taxation. A measure of insulation. A measure of a material's resistance to the passage of heat. The higher the R value, the more insulating "power" it has. For example, typical new home's walls are usually insulated with 4" of batt insulation with an R value of R-13, and a ceiling insulation of R-30.